www.microsoft.com/mac Retail price: Starts at $99; volume licensing available. Office for Mac Academic 2011 artfully blends the familiar Office suite tools with several new features and improvements to deliver a robust tool kit well worth the price of upgrading. Quality and Effectiveness: Important new components for 21st-century students include support for collaborative work through online cloud-based document sharing over Microsoft Windows Live Drive or Microsoft SharePoint. 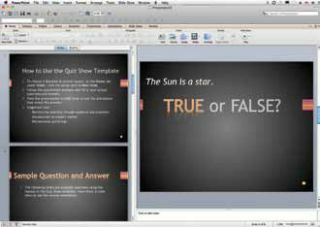 In Office 2011, you can also create and broadcast a PowerPoint presentation to anyone anywhere over the Internet. Designated viewers do not have to have PowerPoint 2011 installed to see the slide show. Embedded audio and video content does not broadcast. Links to online movies and Web pages continue to work, however, and viewers can click those links to access content outside the show. Ease of Use: The userfriendly interface of Office 2011 combines the best of both Macintosh and Windows worlds. There’s a recognizable collection of drop-down menus at the top of each application window, the familiar Standard and Formatting toolbars, plus a manageable Ribbon that replaces the old Formatting Palette. Unlike Office apps for Windows, the Ribbon interface in Office for Mac 2011 adds to rather than replaces familiar features. For example, teachers will appreciate being able to turn tracking on with two simple clicks (Review tab/slide Track Changes to “on”). Another ease-of-use feature is the new Word Document Gallery for quick access to documents and templates, like calendars, flyers, newsletters, and posters. An improved Find and Replace command now includes a search box on the Standard toolbar in addition to a quick preview of text search matches in the search pane of the sidebar to the left of the document window. Finally, PowerPoint for Mac 2011 supports layers, offering more control over the way objects such as text boxes, graphics, and shapes are positioned on a PowerPoint slide. Creative Use of Technology: The latest version of Office supports Visual Basic scripting, enabling users to record and edit time-saving macros and share them across platforms. A new feature built into Outlook 2011 for Macintosh lets users preview the contents of email using Apple’s Quick Look capability. You can also choose to display email messages grouped by threaded conversations, so it’s easy to locate topic-related messages. ¦ The new Ribbon interface is nonintrusive, as users can continue to rely on familiar drop-down menus. ¦ Documents can be shared, viewed, and edited online in a browser using Microsoft Web apps and Windows Live. ¦ Compatibility across platforms for files created in Word, Excel, PowerPoint, and Outlook allow users to view and edit documents regardless of which application created them. Office 2011 for Macintosh makes sense in school settings where students are encouraged to collaborate on projects or complete work assignments outside class. Applications load quicker. Files created in Office 2011 are fully compatible with files created in Office 2010 for Windows, so users can complete work assignments regardless of the platform that does the work.